This cake appeared in Milan, northern Italy, around the 15th century, and the custom of consuming Panettone spread immediately all over the world. But how was panettone born? There are many legends around this traditional product. They are almost all love stories, and we shouldn't be surprised, since Milan, notwithstanding its aspect, its work oriented attitude, its traffic, and everything else, it has always been, and will always be one of the most romantic cities in the world. Here are some of these legends. The first one is a love story: it is the XVth century, the Court of the Duke Ludovico Maria Sforza. Ughetto, the hawk breeder of the Duke, loves the studying and the solitude. But he especially loves the beautiful daughter of the baker, Adalgisa. Their love, as it often happened back then, was opposed by Ughetto's family. So he could only meet the beautiful Adalgisa at night, when he could avoid her family surveillance. Moreover, Adalgisa at night was up too, because she had to attend to the bread making in her father bakery. Unfortunately, a series of misfortunes happened to the baker all at once. He started losing many clients, another bakery opened up nearby, then the bakery boy fell ill and Adalgisa was forced to do all the heavy chores. Then Ughetto had an idea: he offered himself as the baker boy and thought to improve the bread adding some butter to the dough: there was no money to buy the butter?... no problem... The young man sold a couple of beautiful hawks and bought the butter he needed. It was an immediate success and it grew even more when Ughetto added some sugar to his recipe. Some glutton found out and the word got around in the neighborhood. Ughetto, happy to see a smile again on his lover's lips, one night added some candied citron and eggs to part of the dough, which was ready for cooking. It was a very special bread and everybody liked it. At Christmas, the young man had another idea and added some raisins. It was a huge success. Naturally at this point Ughetto and Adalgisa's dream came true and they could get married. Their secret soon became common knowledge; soon enough in every block bakers made big shapes and big quantities of the sweet bread with raisins. A very similar story, but without the romantic part, says that the invention of the sweet bread wasn't the work of messer Ughetto, but of sister Ughetta that, in order to please the other nuns, invented a very successful sweet bread for Christmas. Sister Ughetta lived in a poor convent with other young nuns: the upcoming Christmas was going to be sad and miserable. But all of a sudden the situation changed when Suora Ughetta came up with this new cake on which she had traced with a knife a cross on the crust of the cake. When the cupola-shaped crust was cooked and golden, the groove left by the knife opened up, creating those bumbs that are still visible today in the traditional panettoni, still manufactured today according to the old recipes. The third legend goes back again to the times of the most flourishing of Milan, during the reign of the Visconti and Sforza families. Court of the Duke Ludovico, Christmas Night. That night at the Castle Sforzesco a big party was given, with music and dance. A luxurious banquet that had to finish with a dessert. The art of dessert-making was a very special art at that time: it showed the quality of the kitchen of the seigniory and especially of the skills of the head chef of an important family. For that occasion the chef had prepared a special dessert, but this, alas, had suddenly burned, it was all pieces of coal. How to fix it? "Dessert!... Dessert!..." demanded loudly the guests. What to do?... In the Court kitchen people were terrified; the Duke's wrath was going to be terrible: back then, they put you to death for reasons far more futile than this. The head chef was scared to death: he was going to get the worst punishment. Toni, the little scullery boy approached the head chef and with trembling voice said: "With the leftovers of what you used for the big dessert, I made my own dessert, I added a few eggs and a little sugar, a bit of raisins and citron... it's a simple dessert, for me and some friends of mine that are gathering tonight at my house... If you want it, there it is...", and he pointed to a big bun, well made, with a big cupola of brown crust. The chef looked at it with great suspicion, but from that dough was coming out a very enticing aroma. And after all, he didn't have much choice... that is, there was nothing else to send up to the table of the Duke's guests, who were protesting louder and louder. He decorated little scullery boy's dessert, put it on a large golden tray and had it sent to the party hall. A big applause saluted the entrance of the unusual cake. The Duchess cut the first slice and in a few moments the whole cake was devoured. A chorus of praises raised from everybody at the table; the praises turned soon into enthusiastic acclamations. The chef's heart quieted down. "Bravo!... Bravo!... What novelty, what a good dessert!". The Duke himself wanted to pay his compliments to the chef, who was the only one who couldn't figure out the reason of all this great success. Naturally, nobody said anything about what had happened. The little scullery boy, astonished and scared, was hiding in a corner. 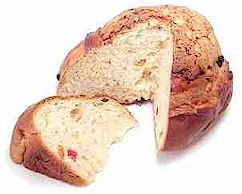 But the truth came out eventually and Toni's bread - "el pan del Toni" - was on everybody's mouth: everybody was talking about this new cake and its incredible sweet taste, popular and aristocratic at the same time. Thus, "El pan del Toni" turned soon in the panetton we know today.